writing songs about all manner of nerdy pursuits. conventions, and general weirdness, you've come to the right place. YOU WILL COME TO MY ALBUM RELEASE PARTY! FRIDAY, APRIL 12th, 2019 at THE SUPERMARKET (268 Augusta Ave), 7:30pm! One week until Yuri's Night! The soundtrack for your Yuris' Night celebration is here! "Songs From A Pale Blue Dot" is now available for pre-order! 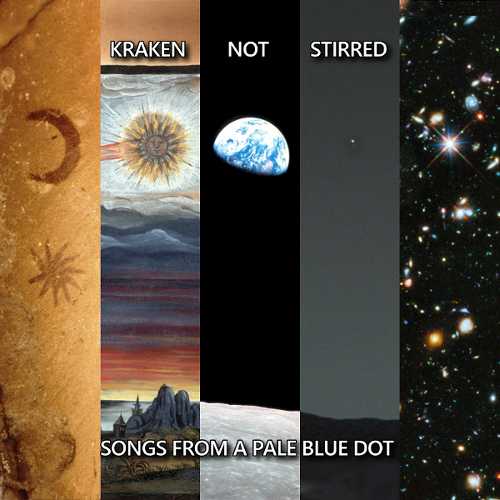 "Songs From A Pale Blue Dot" consists of ten songs about the history of space exploration. Click here for more info! AN INTERVIEW WITH THE MIGHTY KRAKEN! In this interview, music journalist and killer robot N3RDROQ-42 delves deep into the Marianas Trench of the Kraken's mind and really finds out what makes him tick. IT'S TIME FOR MY ANNUAL YEAR IN REVIEW! ...and I turned those songs, along with a bonus instrumental, into an album! I also had my minion cover Meri Amber's Pizza and Ice Cream. Coincidentally, Meri Amber also covered one of my songs this year. My minion was interviewed by Fandomania. I was nominated for an Aurora Award for Robots vs Monsters. So that's pretty cool. And I made my minion play two concerts and attend a few conventions to spread the word of my incredible moistenedness. Speaking of concerts, keep April 12th open. "Old News" is an oxymoron. But here it is, anyway.